A bow sight doesn’t get any simpler and still tout the luxury features and build quality of the Grinder. When Spot Hogg released the Grinder to the market, they wanted to deliver a high-performing and yet simple bow sight for the avid hunter. It’s strong, solid, and well-built with a complete aluminum construction. Its design is simple, compact, and rugged. It’s not anything flashy to look at, but it’ll hold up in the hunt and that’s what counts. To eliminate sight peep issues when day light conditions change, the Grinder comes with Spot Hogg’s new MRT (Multi Ring Technology) tech. 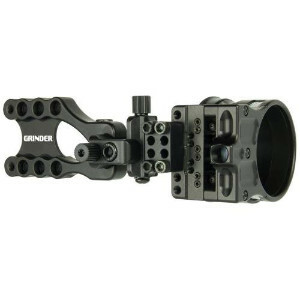 This interchangeable system allows for mounting various-sized shooter’s rings. It provides a “well-lit,” inner ring to eliminate the blank space and fuzzy picture sight during bright conditions, and during low light conditions, the outer ring will be visible. To help you make accurate shots at various distances, this model comes with 5 fixed .019″ fiber optic pins. They’re fully enclosed and protected for ultimate durability. This model is also available with or without Spot Hogg’s Micro Gang Adjustments. The Grinder is the lightest and shortest bow sight the brand offers to date. Weighing in at only 7.8 oz and being only 5″ long, it truly is a small and obscure sight. This bow sight is a hit with hunters who want to set their pins and forget the rest. It’s easy to employ, see, and hunt with. Will it last hunt after hunt? Spot Hogg guarantees it. But, it’s kind of expensive for a bow sight that doesn’t offer tool-less adjustments. What is Micro Gang Adjustments? This model features the micro gang adjustment feature, however, you can order the Grinder without it. The micro gang means you can move all the pins simultaneously to the left/right and up/down. You don’t have to move your sight housing and your pin gaps don’t change. This is beneficial for times when something slips on your string, you have to readjust your peep, or if you’re replacing your string. Does Micro Gang Adjustments Replace Sighting in Individual Pins? No. With elevation, you gang adjust to get your first pin close to the center which is usually your 20-yard pin. Then you still must individually set each pin. How Many MRT Rings come with the Grinder MRT? The Grinder comes with three MRT rings of various sizes. It’s easy to thread on the ring you want to use. Unthread if you want to change it out. What Pin Sizes come with the Spot Hogg? This Grinder model has .019″ fiber optic pins, but it’s also offered with .010″ and .029″ pin sizes. How Many Pins does the Grinder bow sight come with? This model has the 5-pin system, however, it’s also available with 3 and 7-pin setups. Does the Grinder Accept a Lens? Yes, the Grinder is lens-ready with built-in threading to accept a lens kit without an adapter. Is the Grinder an Ambidextrous bow sight? No. However, the Grinder is available in both right and left-hand models. Where is the Spot Hogg Grinder made? This bow sight is a made in the USA and comes with a Spot Hogg lifetime warranty. Narrowing things down, the Spot Hogg Grinder bow sight has a few stand-out features that separates it from the basic-of-the-basic bow sights in the market. With MRT, micro adjustments, and gang adjustments, it makes for an easy to use and forget-and-set-it bow sight for the field. The fact that it’s made in the USA is also a bonus feature that can’t be understated. Like many people that are fans of Spot Hogg, there’s never only one Spot Hogg that you like, there’s always more. On that note, we really like the Fast Eddie XL for its convenient features. Tool-less adjustments, MRT tech, and 2nd/3rd axis adjustments are available. It also has the double-pin setup and a dovetail mount for easy detaching in a jiffy. Check out our Fast Eddie XL review. Another 5-pin bow sight that’s cheaper than the Grinder is the TRUGLO Hyper Strike. Believe it or not, it has tool-less adjustments, 2nd/3rd axis adjustments, DDP system, and a 1.9″ sight for more field of view – check out the Hyper Strike here. While it’s more cost effective, you might have to do some serious comparisons between your budget and brand loyalty if you’re undecided. The Grinder isn’t meant to be a flashy, fancy, or complicated sight. It’s meant to be used in the field, help you see more than ever before, and stay focused with minimum fuss and nonsense as possible. When it’s described this way, isn’t this everything a bow hunter could want? Spot Hogg keeps it simple.